We’re missing a bridge. A bridge between the various Rebel cells we’ve seen in Star Wars Rebels, and the united Rebel Alliance that comes together in Rogue One and destroys the Death Star in A New Hope. This clip begins to reveal that transition. That’s Genevieve O’Reilly reprising her role as Mon Mothma from Revenge of the Sith and Rogue One. Which, in itself, is pretty cool. But also, Dantooine was a Rebel base before everyone up and left to go to Yavin IV, the base in the movies. Remember when Princess Leia lies to Tarkin about it? The Empire find remnants there but the base had been abandoned for some time. That sort of places us on a timeline where we have a better idea how close Rebels is getting to Rogue One. Sometime soon, the Rebels have to leave Dantooine and go to a new base, probably Yavin. Will Mon Mothma’s escape be the reason why the Rebels leave there? It could be. We’ll have to wait and see. 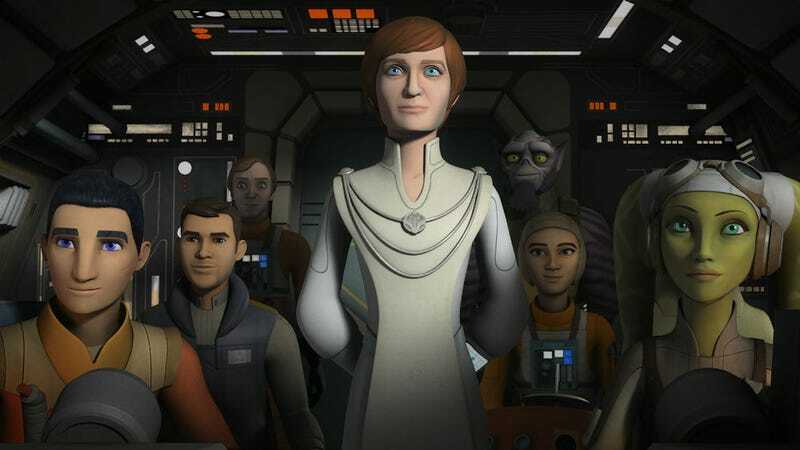 Nevertheless, Mon Mothma coming out and using the Ghost to begin aligning the Rebels is damned exciting.